Patronage — permanent bonuses that are activated after the Aes is enhanced to the first level. They are active regardless of whether the Aes is summoned or not. 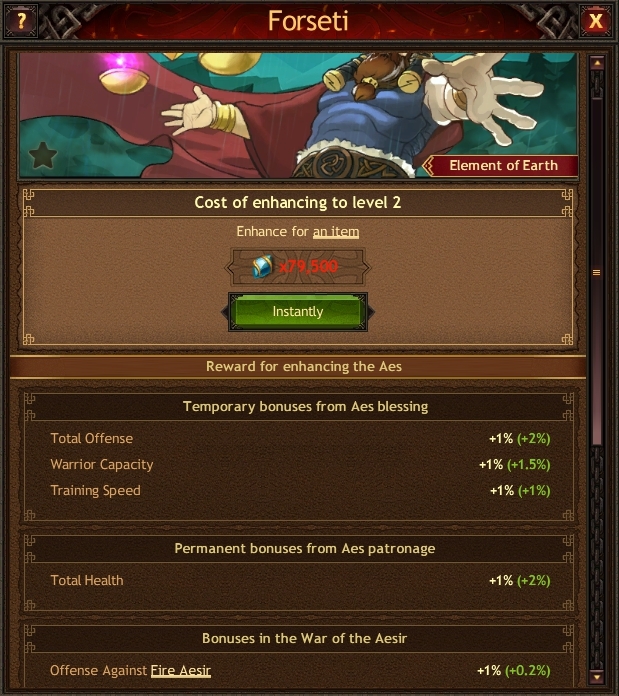 Blessing — temporary bonuses that are active for a certain amount of time, after which the Aes needs to recover. To receive the bonuses from blessing, you need to summon an Aes. Bonuses in the War of the Aesir — bonuses of Aesir of various Elements that are active only if an Aes is summoned (read more in the War of the Aesir subsection). You can have only one Aes summoned at a time. Summoning a new Aes will cancel the current blessing, and the previous Aes will go to recovery.